An elegant pair of cubic zirconia set ribbon stud earrings, crafted in smooth sterling silver to refresh your look, whatever the occasion. Designed to sparkle. 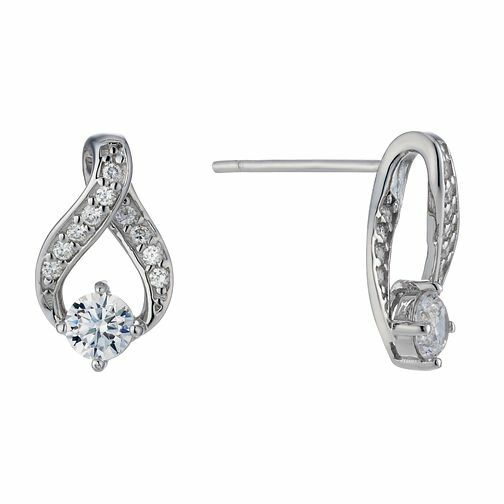 Sterling silver cubic zirconia stud earrings is rated 4.7 out of 5 by 3. Rated 4 out of 5 by Anonymous from Great price, pretty item. Lovely earrings. Great price for the product and unusual design. Rated 5 out of 5 by Anonymous from The earrings are gorgeous! Whilst it was hard to track down these earrings in stores near me to see them in person before buying them, I do not regret buying them online at all! They are gorgeous! Bought for a special occasion and so have not yet been worn. But they are so pretty and I cannot wait to wear them!